UTA Artist Space and Harlem’s Alicia Keys talented husband Kasseem “Swizz Beatz” Dean are pleased to announce the launch of a one-on-one interview series that puts distinguished creatives across contemporary art, music, and film in conversation and in front of the camera. The series launches today, March 22, 2019, and features Swizz Beatz, Carrie Mae Weems, Troy Carter, Terence Nance, Arthur Jafa, and more. The series is created in celebration of the group exhibition DREAMWEAVERS (co-presented by UTA Artist Space and Kasseem “Swizz Beatz” Dean and curated by Nicola Vassell), and is produced in partnership with Lyft Entertainment, which has a mission to champion creative expressions from a diverse set of artists and storytellers. Each episode is produced and directed by Migos and Halsey collaborator and Mamag Studio founders Sing J. Lee with Sylvia Zakhary. … share their enthusiasm for collecting art. 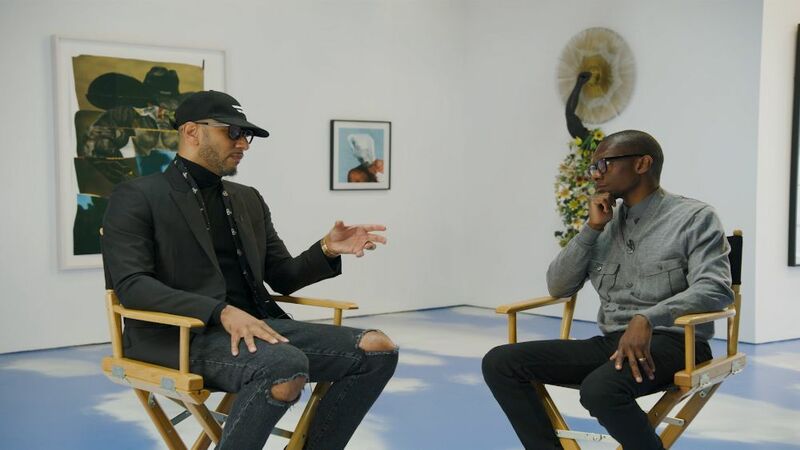 For the inaugural episode, music producer Swizz Beatz sits down with Troy Carter, an entertainment manager who defines pop culture with entertainers like Lady Gaga and Eve formerly in his roster. The two music industry experts share their enthusiasm for collecting art. The conversation is filmed at UTA Artist Space, set against a backdrop of paintings, sculptures, and photographs created by some of the greatest artists of our time. Subsequent episodes will feature creatives like Terence Nance, the filmmaker behind HBO’s comedy series Random Acts of Flyness; Arthur Jafa, an artist, pioneer of black cinema, and regular collaborator with Spike Lee, Beyoncé, and Solange; and Carrie Mae Weems, the indomitable visual artist who features TV shows starring powerful black women, like Empire and Scandal, in her photography. Jafa and Weems both have works featured in DREAMWEAVERS. Further names to follow. Photo credit: Kasseem “Swizz Beatz” Dean and Troy Carter in conversation at UTA Artist Space. This entry was posted in Art and tagged Arthur Jafa, Carrie Mae Weems, Mamag Studio, Swizz Beatz, Terence Nance, Troy Carter, UTA Artist Space by Harlem World Magazine. Bookmark the permalink.